Tehama, Glenn and Colusa Counties host over a million and a half acres of productive grazing rangelands. 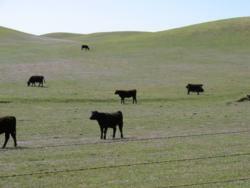 Foothill rangelands are the primary forage resource for grazing animals in California (wildlife and production livestock). The importance of these rangelands is due to the unique Mediterranean type climate of the Sacramento Valley. Mild winter weather provides a source of winter forage that is unavailable in most parts of the US. In addition, the three county's highly productive valley soils provide very high quality irrigated pastures for summer grazing. Societal concerns for the preservation of native vegetation, water quality, and grazing practices directly affect livestock production in these counties. This is augmented by the growth in population targeted for the county in the near future. Livestock production is already strained by large investments and marginal returns. Proactive research and educational materials in multiple subjects are necessary to keep livestock producers economically and environmentally sustainable. The livestock and natural resources program conducts research and educational support in the areas of range improvement, weed control, feeding and supplementation strategies, grazing and irrigated pasture management. Current and future projects work to keep production agriculture and natural resources healthy and sustainable. The program is conducted by Josh Davy. Josh has a Master of Science in Animal Biology, is a Certified Range Manager through the California Department of Forestry and Fire Protection, a Certified Professional Animal Scientist through the American Registry of Professional Animal Scientists, and holds a Qualified Applicators Certificate through the California Department of Pesticide Regulation. Timely newsletters are published to relate information, research results, and workshop announcements. To view previous newsletters, or sign up to receive new editions by email when they are published, click the "Livestock and Range Newsletters" link on the left. The "Livestock and Natural Resources links" tab on the left side of this page provides a host of information that you may find of value. Please feel free to contact Josh for more information or leave a comment or question through the link below. Josh Davy can be contacted at 530-527-3101.